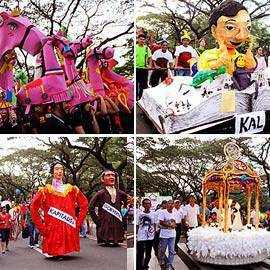 Pacquiao, Gundam, and Filipiniana-themed floats were paraded around the campus. 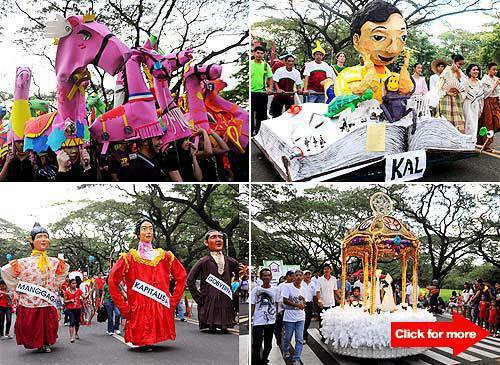 The annual lantern parade featured Filipiniana-themed floats, an ode to Pacquiao and more. Click for more. (SPOT.ph) At the state university, the year always ends in a competition: student-designed lanterns and floats are paraded around the University of the Philippines (UP) Academic Oval in hopes of being judged as the best for the year. This year’s December 16 parade was dubbed "Pasko 2011: Isang Unibersidad, Isang Komunidad," with most floats tackling socially relevant issues such as LGBT equality, the passing of the RH Bill, government transparency and more. The float of the College of Music was accompanied by music while the UP Babaylan donned glittering outfits to showcase their own version of the Pride March. Third place went to the UP Asian Institute of Tourism (AIT) for their sarimanok-inspired lantern, the College of Arts and Letters (CAL) bagged the second spot, while the College of Home Economics placed first with their Filipiniana-themed float. The College of Fine Arts (CFA) was exempted from the competition, being the lone member of the Lantern Parade Hall of Fame. The festivities were also marred by fireworks flying into the crowd, injuring 17 onlookers, at around 8:30 p.m. near UP’s Quezon Hall. The injured audience members were brought to Capitol Medical Center for treatment. The annual lantern parade marks the beginning of Christmas break for UP students.